Fits all standard NEM 2 rail DC and 3 Rail AC railways. Bridge length is 253mm (9.96") which represents 22m or 72'.The minimum separation between track connection is 9 degrees. The turntable includes filler sections having 1 degree; 3 degree; 6 degree; 9 degree separation. Consequently, any track separation starting at 9 Degrees in 1 Degree steps is possible. A maximum of 40 track connections is possible. 4 Track connections for 2 Rail DC are supplied. 42616 is the additional track pack one can expand with. If the turntable is to be used on a AC System, the hobby store will supply in exchange the 2 rail for 3 rail connectors. Extension tracks are under # 42617. The turntable drive motor operates with 14 V AC voltage. The rail power is DC or AC depending on the system. A control unit is supplied with the turntable, it selects the direction of travel and starts the movement. If the switch is released, the turntable will stop at the exit track. 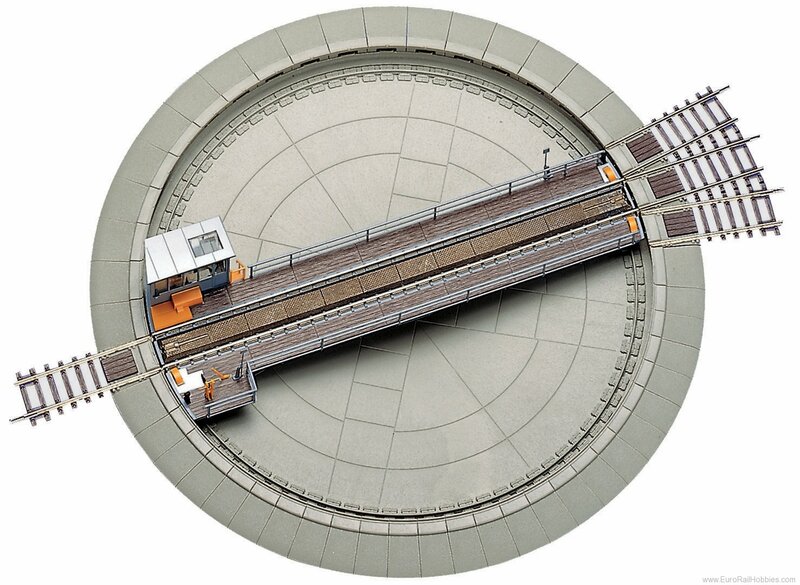 The turntable is designed for use of a pre-selection control which allows the direct selection of a specific track exit.